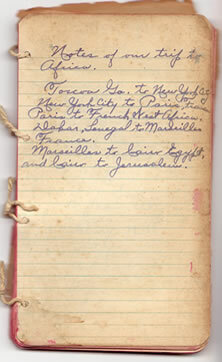 Editor’s note: The diary that contained the Forrest’s trip to Africa in 1930 was recently discovered and we want to share it with you now. Dr. and Mrs. Forrest left Toccoa on February 3, 1930. The diary that you have been reading each week actually follows this one. 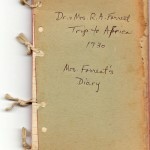 During a recent search of the archives at Toccoa Falls College, the African diary was found in a folder tucked away in the back of a filing cabinet. Over the next few months, you will be reading about the early part of their journey around the world. Then we’ll conclude with their trip to Canada and to the Christian and Missionary Council. In the Spring of 1930, Evelyn and Richard Forrest embarked on a trip to the Holy Land and then on to Europe. The following is taken from her personal diary written while on this trip. Please check back each week for new entries as you step back in time and travel with Mrs. Forrest on her journey. Also, please note that some names of cities have changed with time due to political shifts in governments. She also moves from present tense to past tense and even uses some shorthand. We decided to leave the text “as is” with the hope that it would help the reader feel more a part of her story. More than likely, she was taking notes and writing while traveling. One more thing . . . by this point in life, Richard was being called "Dad" by Mrs. Forrest, who had become known by some as Mother Forrest. Their family—the family of Toccoa Falls—was growing, and the Forrests cherished the idea of the students seeing them as being a part of their personal lives. Enjoy! Toccoa, Ga. To New York City — New York City to Paris, France — Paris to French West Africa, Dakar, Senegal to Marseilles, France. Marseilles to Cairo, Egypt and Cairo to Jerusalem. To read a diary entry, click on a link below.